The Nizhne-Bureyskaya HPP will primarily involve a 47m-high dam, integrating floodgates and spillways, a turbine building and a switchyard. Image: courtesy of RusHydro. The construction works for Phase 1 are scheduled for completion in 2016. Image: courtesy of EMERCOM of Russia. The 320MW Nizhne-Bureyskaya HPP will be equipped with four 80MW hydro units. Image: courtesy of EMERCOM of Russia. 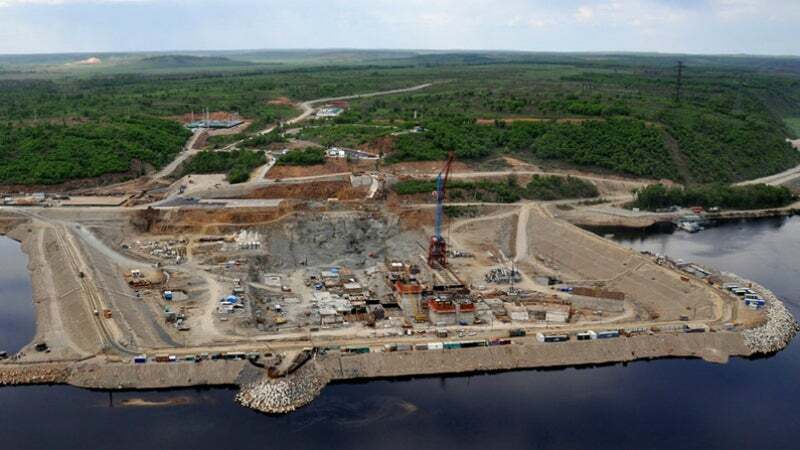 The 320MW Nizhne-Bureyskaya hydropower plant (HPP) is being constructed on the Bureya River in Novobureyskiy, Bureyskiy District, Amur Oblast, Russia. It is being developed by Nizhne-Bureyskaya HPP, a wholly owned subsidiary of Rushydro, who has signed an agreement to form a joint venture with China Three Gorges (CTG) for the operation of the new HPP. The Russian hydropower project is estimated to require an investment of approximately RUB31.31bn ($408m approximately). Phase one of the project, integrating two 80MW hydro units, is scheduled to come online in 2016. The next phase will involve the construction of two more 80MW units. On completion of both the phases, the power plant will have an annual output capacity of 1.65 terawatt hour (TWh). The project forms part of the larger Unified Bureya Energy Complex in the Amur Region. It will complement the existing Bureyskaya HPP, which is located approximately 90km upstream and was commissioned in 2009. The new plant is being developed to regulate uneven water discharges from the Bureyskaya HPP and to mitigate flooding of adjacent towns and local communities, besides its primary purpose of generating power. The project primarily involves the construction of a 47m-high dam, integrating floodgates and spillways, a turbine building and a switchyard. Each of the four hydro units will be equipped with a Kaplan turbine, incorporating an automated control system, and a hydrogenerator with excitation system. The impeller cavity of each hydroturbine, where the blade turning mechanism is located, will not be filled with oil, excluding the possibility of oil leakage into water. The construction of the hydropower plant was launched in 2010 and the official pouring ceremony of the first cubic metre of concrete was held in August 2010. As of early-2015, 60% of the required concrete for the project was poured. The initial filling of the reservoir is scheduled for March 2016. The turbine components were delivered between February and November 2015. "The new plant is being developed to regulate uneven water discharges from the Bureyskaya HPP and to mitigate flooding of adjacent towns and local communities." Initial power sales and supply agreements were signed with a number of parties in August 2010. The parties include AK Transneft for the external supply of power to its East Siberia Pacific Ocean 2 (ESPO-2) pipeline, Mechel to power its Elginskoye coal deposit, Amursnab, Petropavlovsk, and the Federal Space Agency (Roskosmos) for powering its Vostochniy Space Center. The hydro-turbines, as well as its ancillary facilities are being supplied by Power Machines. Quality control services during the construction phase of the project are being rendered by Sweco Soyuz Engineering. VNIIR Hydroelectric Automation has been contracted to supply a 220kV gas-insulated switchgear (GIS) and an SF6 GIS for the project. The facilities for the transmission of power from the HPP to the ESPO-2 pipeline are being constructed by FGC UES.